Captain Geoffrey Poulden double checked the Sun Compass to verify their heading. It was crudely mounted above the dash right where the windshield would have been. The trucks used to have the newer P8 compasses but those had been ruined some time ago, forcing them to use the old and still reliable Sun Compass. The sun remained the most reliable thing the LRDG had. Geoffrey glanced up. It was still there, burning exposed skin, and bleaching everything else. Thankfully, the second most reliable things they had were their trucks. When these trucks arrived in North Africa, they were brand new Chevrolet WB 30 cwt 4×2, straight from Detroit. Once they got into the hands of the New Zealanders that formed the original LRDG, hacksaws and cutting torches were used to remove the tops and anything that would be otherwise useless. Then they were painted the same color as the desert sand. After the trucks had been passed down from squadron to squadron to the Englishmen who formed “G” Patrol there was little of the original trucks left save for the frames. As trucks broke down, they were cannibalized savagely to keep the rest of the trucks operational. There are been seven trucks in Poulden’s squadron, and twenty five men. Now it was down to three, crewed by nine. The first truck was marked with a crudely painted scorpion in a circle, right in the center of the hood. 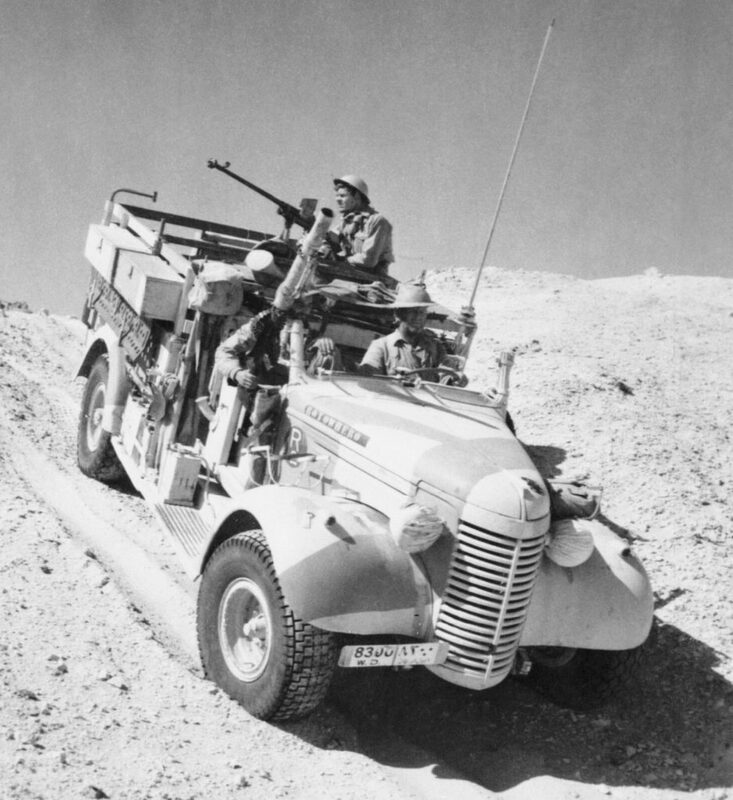 Geoffrey rode shotgun, while Staff Sergeant Nathaniel Allum drove, and Sergeant Dale Collier, the young man from Cambridge manned the new dual Browning fifty cal machine guns mounted in the back of the truck. Geoffrey looked in the back and saw that Collier was fast asleep again on top of a pile of rolled camo netting. Dale was good with the guns, and while he should be keeping an eye out for aircraft, Geoffrey let him sleep. Dale had been awake longer than the rest of them, and they were still well within friendly territory. It would be dark soon and it wouldn’t matter. He wanted Dale to be well rested tomorrow come sunrise. Because they would be deep in the desert with no support then… and the skies wouldn’t be trusted. The second truck had Lieutenant, Eugene Baskett commanding, Staff Sergeant Roger Friedman driving, and Richard O’Carroll standing in the back of the truck holding on to his dual mounted, .303 caliber Vickers guns. Richard looked like he was wiping them down with a rag. They were good guns, but required a lot of care. Richard O’Carroll was probably the youngest man in the squadron, having come to the LRDG from the 2nd Lancers. He was used to tanks instead of trucks, having trained extensively with the Crusader light tanks. Fat lot of good that did him here, but along the way he learned how to run a Vickers K Machine Gun, so he was useful. Their truck was also their Wireless Truck. It had several long antennas and radio sets that worked well… most of the time. The third truck was their Gun Truck, they called it Anvil. Unlike the first two truck, Anvil was sporting a 37mm Bofors Anti-Tank gun. Sergeant Roberto Goss was a wizard with it. They had tried to give him one of the captured Breda 20mm guns, but Roberto insisted that the Bofors were better and hit harder. Most thought the Bredas were more accurate, but Roberto just laughed and asked when was the last time he missed. No one could argue that point. Roberto Goss never missed. The gun truck was called the Anvil because when Roberto fired that Bofors, a few seconds later you would hear the loud “clang” of the shell slamming into target. The gun might not be able to punch the newer Panzers, but anything lighter would be wrecked. Roberto had made thousand yard hit on a moving German 232 Scout car. One shot, one kill. No one tried to take the Bofors away from him after that. Staff Sergeant Logan Weston drove Anvil. He was able to somehow keep Anvil from getting stuck even with the heavier weapon and ammunition she carried. Lieutenant Philip Clayton was Anvil’s commander, and had a knack for positioning Anvil so Roberto had a good angle to biggest problems. Philip had been given a wide brimmed Stetson hat from an American cavalry unit, and he’s worn it ever since. Geoffrey was a little envious. The hat was almost ridiculous, but it did good work keeping the sun out of Philip’s eyes and off his neck. Like the rest of the men, Geoffrey wore the Arab style headgear called a keffiyeh, which was pretty much a scarf held to his head with some black rope called an agal. It did fairly well in the heat, but a cowboy hat would be better, Geoffrey thought. Enjoying where this is going! Been following this over at WeTheArmed . Good stuff, George. Interesting picture. Believe it or not yesterday I was in the local B&N and found that pic in a book about the Jewish members of the LRDG. Can’t remember the name unfortunately. “Something, something and the Battle for Tobruk” IIRC. Anyhow neat story so far.